1. Heat oil in a pan for the masala. 2. Add all the masala ingredients except copra. 3. Fry till dal turns golden. 4. Add copra and grind to a fine powder. 5. Cut the brinjals into quarters and soak in salted water till required. 6. Wash dal and drain. 7. Pressure cook with 1/2 cup of water for 5 minutes. 8. Heat ghee for tempering in a frying pan and fry the tempering ingredients. 9. When mustard seeds start spluttering, drain the brinjals and add it to the pan with tomato. 10. Saute for 2 minutes. 11. Add turmeric powder, tamarind extract, salt and ground masala powder. 12. Simmer for 10 minutes till the brinjals are tender. 13. Add the cooked dal. Simmer. 15. Remove from rasam froths up. 16. Serve hot with plain rice. Tip: If the rasam is thick, add more water. 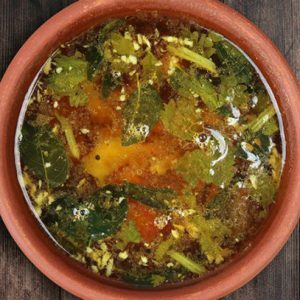 Feel free to comment or share your thoughts on this Kathirikkai Rasam Recipe from Awesome Cuisine.